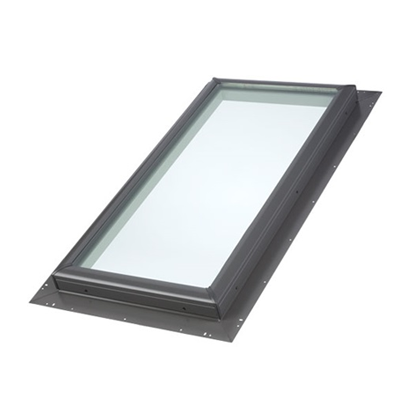 The VELUX QPF Pan-Flashed (self-flashing) Skylight is a deck mounted Skylight. The QPF comes with an integrated aluminum pan flashing, which installs directly to the roof deck. The QPF installs on a pitched roof deck that has asphalt shingles. Why we like it: Affordable, easier to install than units that require a separate flashing kit. Bonus - it can be ordered with factory installed solar or manually operated blinds. Oh, and did we mention it can be installed horizontally, or vertically?